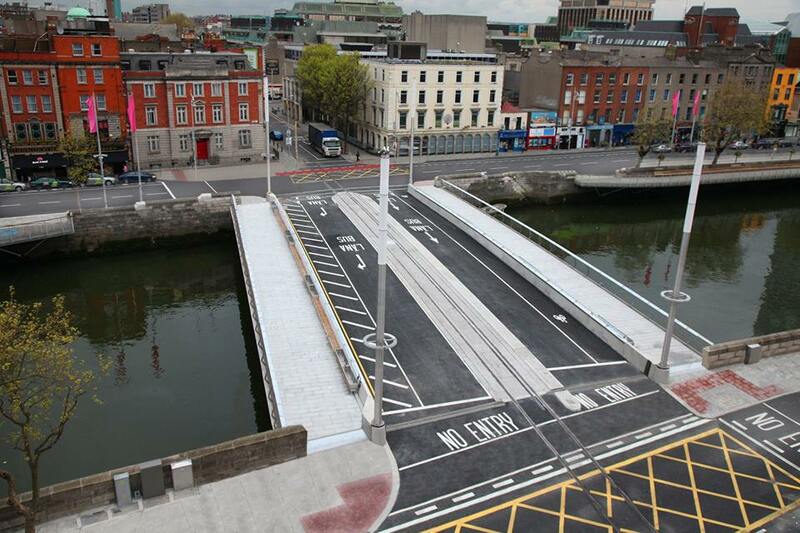 Dublin’s latest bridge, the Rosie Hackett Bridge, opens to public transport and cyclists this morning, but the bridge excludes a contra-flow cycle lane which is included in the planning permission for the structure. A northbound cycle lane was part of the planning application made by Dublin City Council and approved by An Bord Pleanala. As part of the bridge works extensive work was carried out on the bridge, the nearby quay walls, and surfaces. To avoid future disruption, tracks for Luas Cross City were laid on the bridge and the quays. But Dublin City Council yesterday said that it will only now conduct studies to look at integrating the cycle lane into the junctions of the quays. “The northbound cycle lane on the bridge hasn’t been installed yet as it needs integration with the quay junctions. Studies will take place with a view to installing it and the space is allocated,” said Dublin City Council on Facebook yesterday. The council has yet to answer questions IrishCycle.com asked it on Monday — we asked if An Bord Pleanala had been consulted about the change in the plan for the bridge and, if not, how did the council come to the view that the planning authority did not need to be consulted on an apparent material change to the plan for the bridge. Contra-flow for cyclists on otherwise one-way streets — with and without lanes or dividers — is common across Europe in a wide-range of cities, such as Paris, Berlin, Amsterdam, Copenhagen and Brussels. There are around 20 streets with contra-flow for cyclists in Dublin — most in the city council’s area and most are in place for years. Progress has stalled or even reversed on making Dublin City more accessible to cycling using contra-flow. 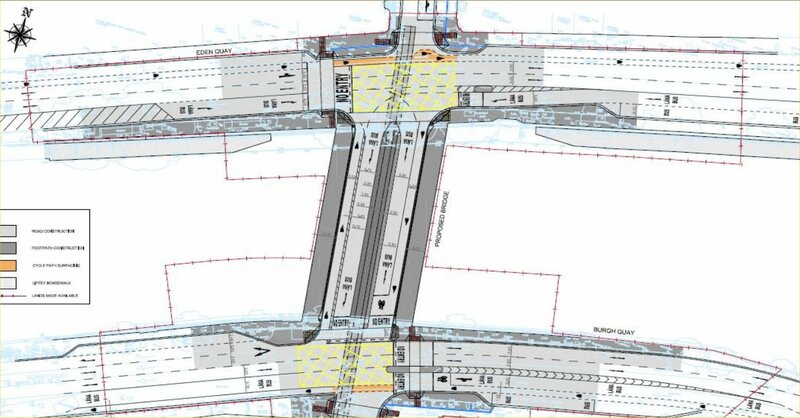 No on-the-ground progress has been made on a 2010 plan to install new contra-flow arrangements in the city centre. Meanwhile, a programme of works to fix faults in or finish older designs around the city, included legally closing off an apparently half-finished contra-flow arrangement at St Stephen’s Green leading up to bicycle parking at the corner of Grafton Street. Elsewhere in the county Dun Laoghaire-Rathdown County Council have recently completed a contra-flow path as part of its Luas-UCD-Dart route, and Cork City Council are installing contra-flow for cyclists around the centre of Cork. MORE: Is this the best designed contra-flow cycle lane in Dublin? Sounds far more inevitable from what Philips says. Yes, but they are doing this now after a massive amount of planning and works which could have and should could have included the cycle lane design. The indications I’m getting is that the council removed the lane and were thinking or hoping nobody would notice. It was only after people questioned them about it, and compliance with planning permission, when they changed tack. Contra-flow has been extensively studied in Germany (not only in Berlin), is officially recommended in the StVO and VwV since 1997(!) and has been found to be effective and unproblematical *in mixed traffic. * When segretation infrastructure like here come into play however things get complicated as always, so Dublin is well advised to monitor it closely. Now, after having had a decent look at the new bridge, I wonder how on earth people are actually expected to get on that contra-flow bike lane? One would have to leave the (in this case useless) bike lane on Burgh Quay well in advance to get on the rightmost lane in time to be able to make a rather surprising right-turn on to the bike lane! Also the lane on Burgh Quay itself is an obvious trap, high bus traffic turning to the left into Hawkings Street with the cyclists outside of the view of the bus drivers which get green light at the same time as the cyclists. It is only thanks to Dublin’s friendly bus drivers if nothing has happened there so far. @Ingo — one solution is go left to turn right aragment on Burgh Quay (cut out of the wide footpath), this would have to include traffic light. The bridge, or more so the layout around it, is a mess for pedestrians. There should have been pedestrian crossings linking both footpaths on the bridge directly to the building side of the quays.